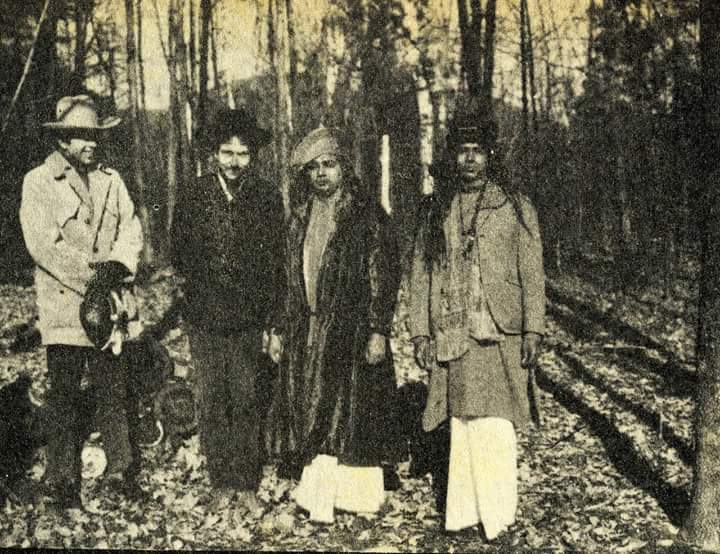 Purna Das Baul, the Baul singer from Dhakuria, has performed in over 20 concerts with Bob Dylan. One of Purna Das's most famous photographs is the one on the sleeve of Dylan's LP John Wesley Harding (1967). It was clicked by Columbia staffer John Berg and features Dylan, Purna Das Baul, Laxman Das Baul and Charlie Joy, a carpenter and stonemason. Bob Dylan was in Calcutta for two hours in 1990 to attend my son's (Dibyendu Das) wedding. I am very happy that my friend Bob Dylan has been given the Nobel Prize in literature. I just cannot explain how happy I am. He should have been given the prize much earlier. What he has composed over the years is meant for everyone; is meant for humanity. He writes about people and the times. He has held a mirror that reflects the soul; he reaches out to the very soul of humanity. Bauls speak about life and people and so do Bob Dylan's songs. All together I did over 20 concerts with Dylan. It all began with a phone call. It was 1967, and I was living on Kali Temple Road at that time. I got a call from the manager of The Oberoi Grand saying that Albert Grossman, Bob Dylan's manager then, wanted to meet me. I remember going to Grand in the evening with my wife Manju Das. I was carrying my ektara and khamak. We had tea and then Albert asked me to sing a song. He was happy with what he heard and asked me, 'Can you come to America with me?' 'Yes,' I said, 'And 10-12 people will also travel with me.' He agreed. Later I learnt that Albert had got my contact details from poet Allen Ginsberg. We flew off to the US and I did a gig in San Francisco, which went off really well. Albert then took me to Woodstock where I met Bob Dylan for the first time, along with artistes like Joan Baez, members of The Band, Tina Turner, Peter, Paul and Mary and many more. For about a year, Woodstock became my base from where I would travel to different cities in the US to perform in a series of concerts. After 1967, I again did another concert with Dylan in 1973 in Madison Square Garden. Then in 1978, I met Bob Dylan in New York. Bob had invited me to attend his birthday celebrations. In 1984, I performed with Bob once again. This time it was in France and I shared the stage with Mick Jagger and Bob Dylan.